It's a new school year, and Terry Pritchard, assistant principal at Brindle Public School, is glad to be back. He loves all the kids but has a soft spot for the students who are struggling and vulnerable. By the end of the term, however, Terry finds himself forced into an early retirement, which is as shocking to the school community as it is devastating to him. Nina Foreman, still reeling from her recent separation and complications at her previous school, jumps at the chance to transfer to Brindle Public and take over Terry's class. There she is confronted by a group of resentful and disruptive students who hold her responsible for the abrupt departure of their much loved teacher. Set in a small coastal community, The Teacher's Secret is a story of scandal, gossip and dislocation, and the search for grace and dignity in the midst of dishonour and humiliation. A new year is about to begin at Brindle Public School and Assistant Head Terry Pritchard is looking forward to the new term. He has been working at Brindle Public School for many years and has seen a range of generations come and go through the school gates. He loves his job - he loves the children, and the children love him. However, the arrival of temporary principal, Laurie Matthews, looks set to turn this school year on its head. She is determined to make some quite severe changes throughout the school and comes armed with her own ideas and procedures- much to Terry's dismay. The pair clash from the offset when Laurie moves Terry's classroom and makes it abundantly clear that she is unhappy with the way that he operates. She is a stickler for protocol and without even realising, Terry often ends up doing things that don't follow Laurie's regulations. We see the fraught relationship between the two quickly deteriorate over the four terms that the story is set, meanwhile we also get to delve into her lives of some of the other residents of Brindle. We hear from Nina whose private life is collapsing before her very eyes as things become strained between her and her husband. We also hear from Mel; once a pupil herself at Brindle Public School she now has children of her own. There's also Sid and Joan; massively intriguing characters who had fascinating background stories that I couldn't wait to uncover. I was interested to see how the characters would be linked together but Suzanne Leal weaves their stories together in a very intelligent and gripping way. The cast of characters within this novel is wonderful. I assumed the story was going to be solely based around Terry, and whilst he is undoubtedly the lead, it was great to have so many other character's stories intertwined with what was going on (although my only criticism is that it took me a while to get it straight in my head exactly who was who, as we are introduced to so many people in quite a short space of time...But that could be down to my awful memory!) I liked the way that these characters were together yet apart as the story progressed and once I did get my head around who was who I became fully submerged and invested in these characters lives. I really liked Terry. It was clear how passionate he was about his job and that he only had the pupils best interests at heart. However, in the current climate I could see how some of his actions and intentions could easily have been misinterpreted. It's a bit of a tricky one - and as much as I disliked Laurie, as soon as I learnt more about her background having worked for child protection, I could see how she was picking up on certain things that Terry was harmlessly doing and interpreting them as something else. Laurie did really annoy me, especially to start off with. Reprimanding the pupils for dancing in assembly? What a kill joy. I could see why Terry disliked her and she certainly did herself no favours. The way in which the book is written is very clever, and leads to a gradual unfolding of the story. Just as one character's story seems to be progressing, that chapter would end and we would move on to the next character which is a really clever technique employed by Suzanne to build tension within the story and keep you guessing as to what might happen. I love books that are set around tight-knit communities that contain shocking secrets, and The Teacher's Secret fits this bill perfectly. It is cleverly written, extremely well researched and is one of those 'Just one more chapter' kind of books. You know the sort - you promise yourself just one more chapter and three hours later you still haven't moved. Full of scandal, tension and with a set of extremely well-drawn characters, The Teacher's Secret is definitely one to add to your TBR. It reminded me of Big Little Lies by Liane Moriaty (which, incidentally, is one of my favourite books ever so this is a massive compliment.) The plot is a strong one and is cleverly played out. This is a book that is at times unsettling, yet is full of heart and emotion at the same time. A huge thank you to Imogen at Legend Press for the opportunity to review. 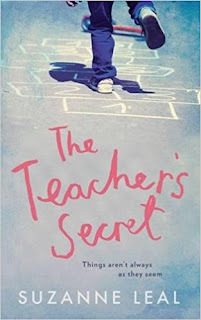 To be in with a chance of winning a copy of The Teacher's Secret, enter via the Rafflecopter form below. UK only. Good Luck!